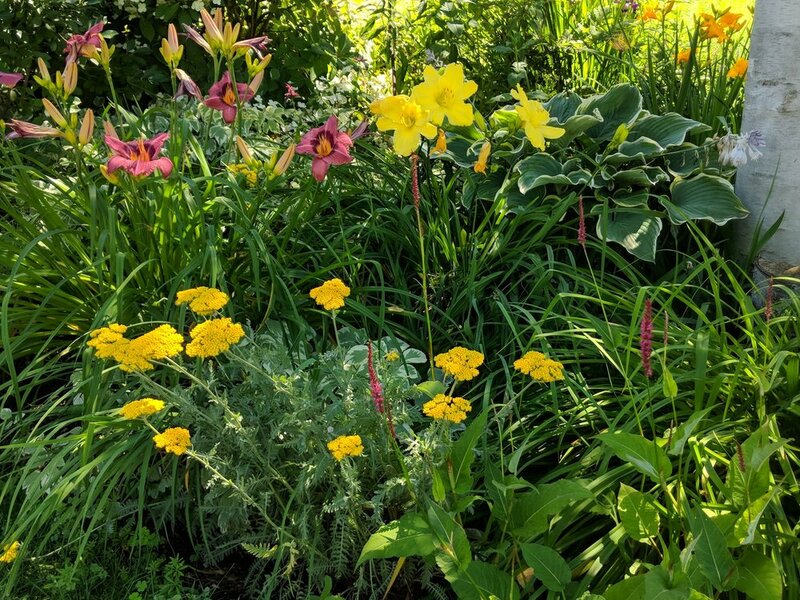 My western garden beds were completely overhauled in March, 2016. Overgrown rhododendrons were removed, a steep slope was properly graded, and a boulder retaining wall and stone path were installed - all paving the way for a brand spanking new 40' long expanse of gardening opportunity! 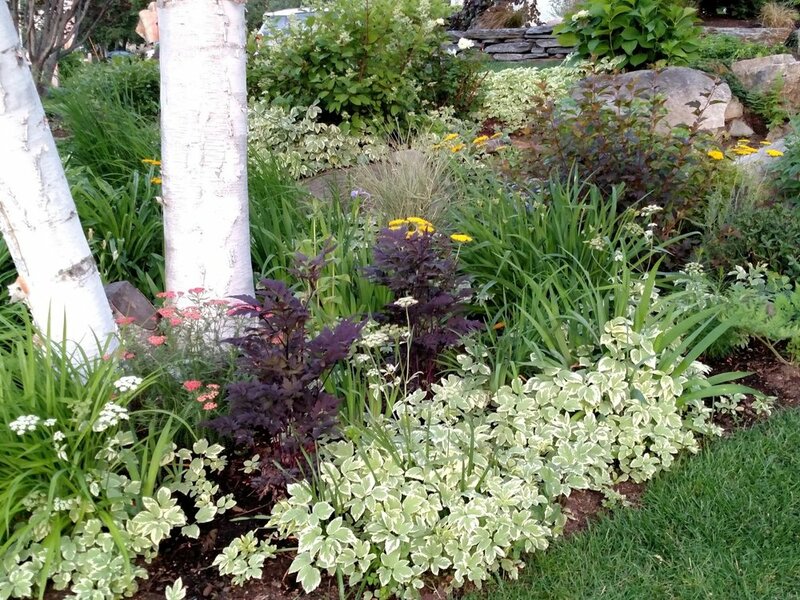 Bill Parker of Parker Garden Design in Nashua, NH supplied the hardscaping design and installation, and high quality garden soil. The locally sourced Goshen Stone boulders and stepping stones blend perfectly with pre-existing boulders from our original construction. 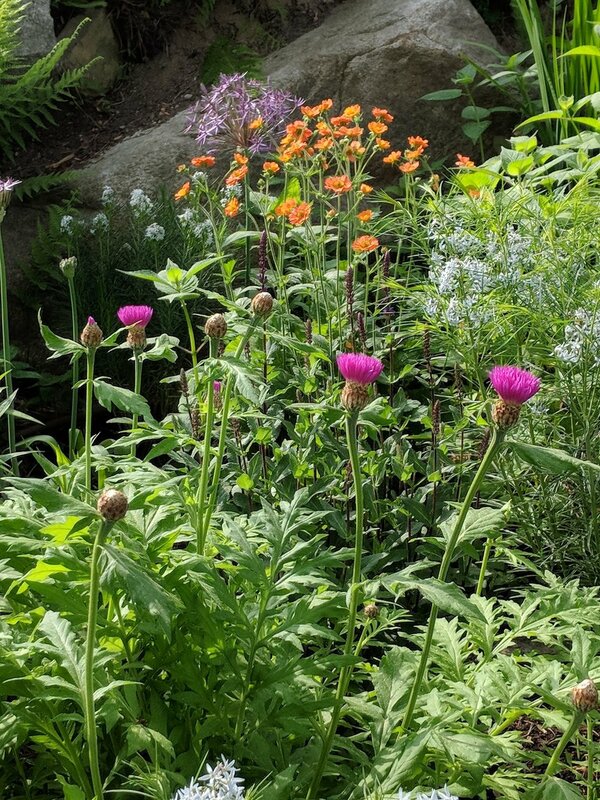 Planting and design assistance arrived in the form of my sister-in-law, Chris Carrington, who owns a garden design firm in Philadelphia. On May 7th, we installed a variety of complementary specimens that we hoped would be well-suited to their new home. The photos above and below were taken less than 2 months later in June and July. Chris and I added more rich organic humus at planting time, including a mixture of my favorite Coast of Maine products: Quoddy Blend Lobster Compost, Wiscasset Blend Earthworm Castings. After the young plants and soaker hoses were installed, everything was topped off with Dark Harbor Blend Enriching Mulch. 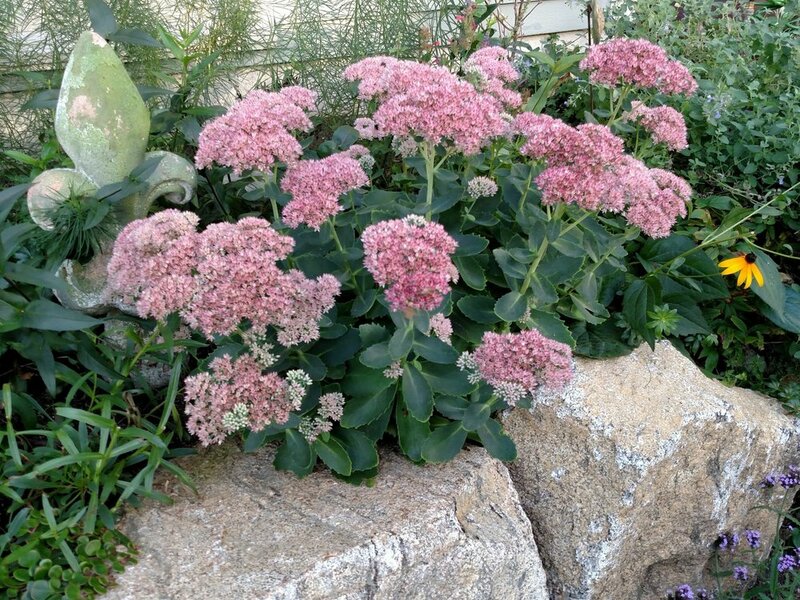 In no time, the 40' of dirt transformed into a stunning mixed border of woody shrubs, perennials, succulents and ground covers, offering May through October texture and color. Then the "locals" arrived - pollinators, hummingbirds, beneficial insects, Praying Mantises...and...bunnies. OK, not so great. The bunnies loved munching on the Baptisia and Yarrow leaves, but they didn't harm the blooms. And new foliage quickly grew back! Click on photos and navigate left or right for more information.